We encourage our customers to do their research before making a buying decision. It's nice to do business with a handshake, but a little homework never hurts. Alaska Stairlift & Elevator has a long history of successful elevator acceptance inspections with the Municipality of Anchorage (MOA) and State of Alaska (SOA). Our work is always inspected by the Authorities Having Jurisdiction as required. Technical capability is also another factor to consider. Our technicians have attended factory training for Bruno, Waupaca Elevator, Pneumatic Vacuum Elevators, and Garaventa Lift. Most of our mechanics have 10 years or more experience in the elevator/accessibility field. Additionally, the equipment we install must meet our quality assurance standards. We only sell products that are durable, dependable, and that we would install for our own family. Our entire staff is here to ensure your satisfaction. We're here for you and we care. 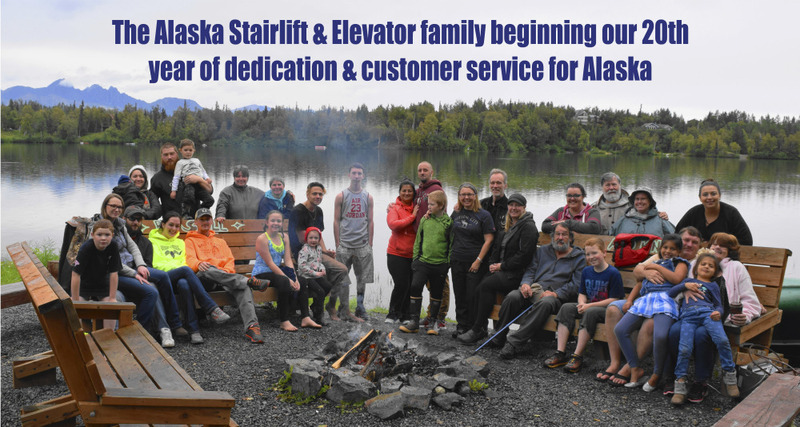 Alaska Stairlift & Elevator has been serving the state of Alaska since 1998. We install and service elevators, stairway lifts and platform wheelchair lifts. We also provide wheelchair lifts in vehicles, portable and permanent ramp systems, ceiling-mounted patient lifts, and durable medical equipment. We're approved providers for Alaska Medicaid, Medicare accredited for patient lift systems, private insurance carriers, worker's compensation insurance, the V.A. and have been awarded several government contracts for elevator services including Eielson Air Force Base, Ft. Greely, Ft. Wainwright, and Joint Base Elmendorf Richardson. Our mission is to bring compassion and professionalism to each person we serve, to provide the highest quality of goods and services available, and to meet each person's unique needs to the best of our ability. We value integrity, honesty, and hard work. Administration: Ensures proper leadership, licensing, compliance programs, financial accountability, standards of ethical conduct, and company-wide performance management. Human Resource Management: Ensures employees have adequate training, qualifications, experience, and continuing education to meet customer needs. Customer Services: Ensures customers receive the right equipment to meet their needs, are given proper training and instructions, rental options provided, 24-hour emergency service is available, ensures written polices for customer satisfaction. Product Safety: Programs and procedures are in place to ensure safe use of equipment and minimize safety risks to end-users and employees. Service Standards: Ensures proper delivery, set-up, and training standards are developed and practiced. Follow-up with customer to ensure satisfaction. Information Management: Ensure confidentiality of customer records, compliance with Health Insurance Portability Act (HIPAA) and other applicable standards. Results tabulated every 6 mos.